I'm using a plugin that allows customers to select a delivery date and that is saved as a Custom Field. My problem is I'm using a Zapier plugin that exports the Woocommerce Order to Google Sheets. Unfortunately Zapier doesn't recognise Custom Fields. So I was hoping that I could copy the 'jckwds_date' date in Custom Fields to the 'item_meta' field. I'm able to edit the plugin, see line 106. You can't use this item_meta because is the meta for an inline product no for an order. If this don't work as expected, you can try to use the customer notes field. The second solution worked a treat. Nope, I found this in another file. 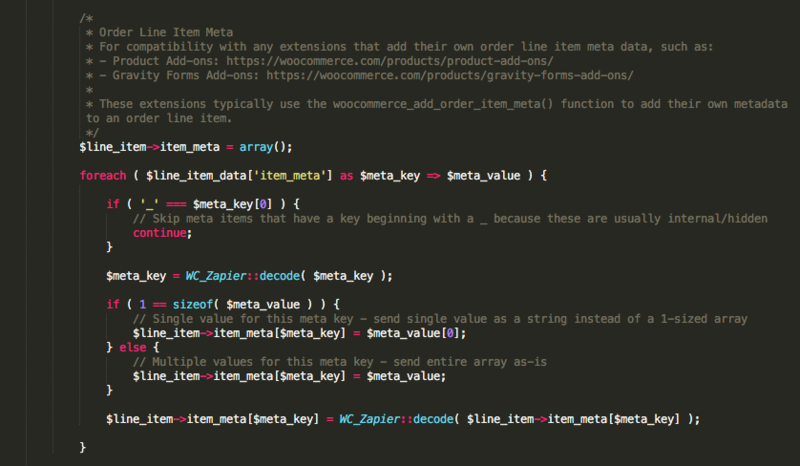 * These extensions typically use the woocommerce_add_order_item_meta() function to add their own metadata to an order line item. * The slug/key for the order status. * Optional text that is added to the end of this Trigger's title inside brackets. * The sample WooCommerce order data that is sent to Zapier as sample data. // WC 2.3 removed the concept of an "after tax" discount, which included deprecating the WC_Order::get_order_discount() function with no alternative available. // This field will be removed in a future release. For now, it will return an empty value. // Only included once the customer has permission to download the files (typically when the order status is Processing or Completed). // See https://docs.woocommerce.com/document/digitaldownloadable-product-handling/#section-3 for more details. $order->has_downloadable_item = $this->wc_order->has_downloadable_item(); // If the order contains a downloadable product. // Order data needs to be an array. the new code which you used is working ?